Sinatra / Capitol Sound Quality (and general discussion): Singles, Soundtracks, Etc. Discussion in 'Music Corner' started by MLutthans, Aug 10, 2013. I've been thinking about how to address sound quality comparisons for all of Sinatra's "other" Capitol stuff, i.e., singles, compilation, orphaned tracks, EP tracks, soundtrack cuts, etc., and since so many songs have been compiled and recompiled in the LP and CD era, the logical way seems to just be to go through the tracks in chronological order, and let the cards fall where they may, so although we won't be doing a comparison that is dedicated to This is Sinatra, for instance, once we've looked at all the tracks that happen to appear on that particular compilation album, you should be able to figure out a good way to hear that compilation in the best-possible sound. No, I am not going to start at April 2, 1953, and work on this day and night (Night and Day?) until we reach "I Gotta Right to Sing the Blues" in 1962. Rather, this will be a sort of "Long and Winding Thread" that we'll revisit and update from time to time. Sound like a plan? How about if we go one session at a time? I probably have a few of these tracks on some oddball Aussie and UK CDs and LPs, too, that aren't popping into my mind at right this moment. •Selections from "Come Fly Away"
Also, if Bob F or somebody else would like to post photos (etc.) from the sessions as we get to them, that's always right up my alley, and makes for a more varied thread, too. dav-here, Darby, spindly and 8 others like this. Many years ago, I authored threads at the Sinatra Family Forum containing session-by-session details, posted on the anniversary dates of the Capitol recordings. As best I can, I'll try to resurrect those posts here as appropriate to the discussion. On this anniversary of Sinatra's FIRST Capitol recording session, I'm starting a similar thread as mentioned above. This one is devoted to the preceding years beginning in 1953. Hopefully, I'll be able to keep up with both threads, and—in four years time—we'll have a complete reference guide to the entire Capitol era. alexpop and hodgo like this. Both of the above tracks have appeared together in various CD compilations and box sets, such as The Complete Capitol Singles Collection (disc 1 of 4) and Sinatra 80th: All The Best (disc 1 of 2). This evening would be Sinatra's last collaboration with Axel Stordahl until late 1961, when the arranger charted Frank's final Capitol concept album, Point Of No Return. Because of the connection to Stordahl, all four of these recordings first appeared on compact disc as extra "bonus" tracks in the 1987 CD reissue of the 1962 LP. 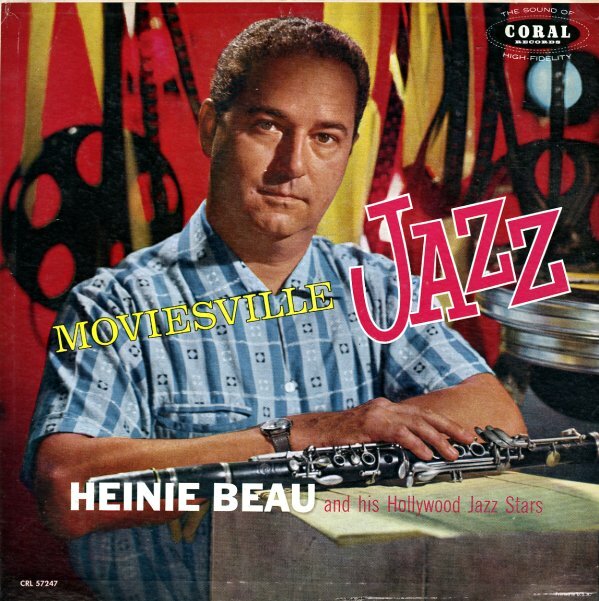 Musicians (20): Rubin "Zeke" Zarchy (trumpet); Vincent DeRosa (French horn); Heinie Beau, Arthur "Skeets" Herfurt, Ted Nash, Leonard Hartman (saxophone/woodwinds); Mischa Russell, Harry Bluestone, Alex Murray, Paul Nero, Irving Prager, Murray Kellner (violin); David Sterkin, Paul Robyn (viola); Cy Bernard (cello); Ann Mason Stockton (harp); Bill Miller (piano); George Van Eps (guitar); Phil Stephens (bass); Ray Hagan (drums). From the latter post, we duplicate the photo below which was taken at this recording session. See that post for photo and source credits. PhantomStranger, jtaylor, The FRiNgE and 4 others like this. Great stuff, Bob. Thanks (then, as now) for posting. •Note that in one shot, Frank appears to be singing into a U47, and into an RCA44 in another. •I like the fire extinguisher next to the U47 preamp in the bottom shot. JonnyKidd, CBackley, joshm2286 and 10 others like this. 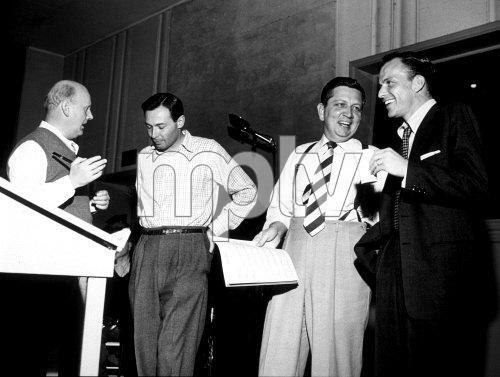 For those who may not know, the gentlemen in the second photo are (left to right): Axel Stordahl (arranger/conductor), Alan Livingston (Capitol A&R head), Voyle Gilmore (producer), and some other guy (boy singer). In the top photo, the sax player at far left is Heinie Beau, no? Could be. Is the hair curly enough? Wonderful thread Matt, the knowledge of you guys never ceases to astound me. Gardo and rangerjohn like this. I think that might be a "staged" shot. However, I never thought to ask John Palladino if they tried a few different mics on Frank at first before using the U47. I figured Capitol had settled on that mic for lead vocals around that time as basically their standard for pretty much any singer, though it was pretty new then. They'd still use a 44 on a vocal group though, at least for a while. I'm pretty sure that's a 44 on the vocal group heard in "Don't Change Your Mind About Me", for instance. joshm2286 and kevinsinnott like this. Great idea, Matt! There's so many excellent recordings that weren't on the concept albums. I'm glad they'll be getting some attention. And nice to have sessions photos that give a glimpse into how these songs were made. I'm Walking Behind You is my favorite from this first session. These four are similar in style to what Frank had been recording at Columbia. Capitol signing Sinatra was the best move in musical history. There is some debate as to which song was intended as the A-side. Ron Sarbo believes I have them reversed (which would normally be the definitive word ). So does the Hoboken Historical Museum, which places "Lean Baby" as the A-side. There are prominent discographies which list them the other way around. For "Lean Baby," we can throw out the The Sinatra Touch mono LP from 1968, which is very compressed. The Alan Dell LP has wide dynamics, as does the 1987 Walsh CD. Anybody have the above, for any of these four songs? AFAIK, the only releases of the Stordahl "Day In–Day Out" were: (1) Point of No Return CD bonus track (1987 Walsh and 2002 Norberg [2000 Concepts box equivalent]); (2) Frank Sinatra Sings the Select Johnny Mercer (1995); and (3) The Rare Sinatra disc in the UK 21-CD box set (1998). Our mother used to say the same thing! Bob F and MMM like this. She always said I was more colorful! + 1 and my brain is a sponge to your guys knowledge. hodgo and rangerjohn like this. •Sinatra 80th: All the Best re-uses the mastering from The Capitol Years 3-CD set. •The 1984 UK "Dell" LP uses reverb-added tapes. MMM and rangerjohn like this. Here's a quick little clip to illustrate the difference between the 1962 "wet" tapes and the original, "dry" tapes. Try to listen to the reverb behind the vocal on the word "starts." The first one is from the 1984 Dell LP (wet), and the second from the 1987 Walsh POINT OF NO RETURN CD (dry). kevinsinnott and rangerjohn like this. Thanks Matt. Nice that Walsh left it dry. Would you say the tone on the bonus track is better than the album tracks, proper, on his PONR CD?